Inside of the Butrint National Park in southwestern Albania you can find the archaeological site of Butrint. 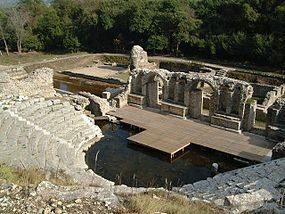 In 1948 Butrint’s importance to the cultural heritage of Albania was first recognized and in 1999 the ancient town of Butrint was designated as a World Heritage Site. There are some globally threatened species which can be found near the antique town of Butrin. The Butrint National Park is comprised of a mixture of natural, semi-natural and artificial habitats. Visitors to the park can find freshwater marshes, reed beds, Mediterranean forests and maquis (shrub land). There are also arable lands and fruit-tree terraces. You’ll also discover coastal waters with rocky and sandy coast. All of these different kinds of habitats shelter a large variety of plants and animals making Butrint one of the most important areas for biodiversity in Albania. Within Butrint there are 16 endangered kinds of flora and 14 globally endangered species of fauna. Lake Butrint is a wetland area which was shaped by a tectonic lagoon. It is surrounded by mountains, forested hills, and by both freshwater and brackish marshes. The lake is connected to the straits of Corfu by the Vivari canal. Butrint has archeological remains which are a part of the natural woodland. This is a most complex ecosystem which is dependent on the freshwater of Lake Butrint and the Vivari Channel which then drains the lake into the Ionian. What makes this area truly incredible is that the natural environment blends in with a landscape consisting of monuments. This national park is home to amphibians, reptiles, birds and mammals like the wolf. This is the only site in Albania which is known to support the Epirote frog, tortoise, sand boa and the Balkan wall lizard. For the birds here Butrint Bay and the Vrina Marshes provide feeding and roosting grounds. When winter comes there are flocks of waders which make use of the shallow waters among them are the European curlew, red shank, grey plover and dunlin. Butrint is a microcosm of Mediterranean history. It represents the rise and fall of the great empires which once dominated the area. There are monuments which represent a span of over two thousand years from Hellenic temple buildings that date back to the 4th century B.C. to the Ottoman defenses that were created in the early 19th century. Visitors can see such historically significant archaeological sites as a theater dating back to the 4th century B.C. which seats about 1,500 spectators. Performances are still given here at a festival held each summer. You can also see a very impressive baptistery which has extensive mosaics and basilica dating back to the 6th century A.D. Near the theater are a canal and vestiges of Roman courtyard houses and a most domineering wall surrounds a great deal of the site. Of interest is the Butrint Museum which features amazing objects that were unearthed during various archaeological digs. Albania is a place that I know very little about actually–intriguing place! Lots of people aren’t aware of most of Albania because it was occupied for so very long and just recently they have started focus on tourism Audrey.